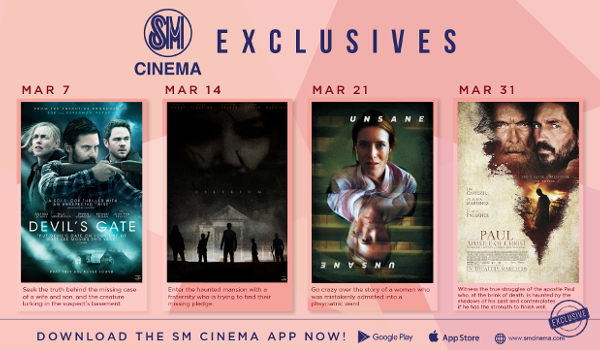 This March, SM Cinema dares you to #BraveYourFears with their exciting and exclusive movie line-up. Grab your friends and conquer your fears of the paranormal, of psychological terror, and even your fear of commitment with SM Cinema’s stellar films this month! Magbuwag Ta Kay or mag-break na tayo in Filipino is a fresh take on the daunting and blissful ride of love. This all-Cebuano RomCom movie proudly represents the Queen city of the South and asks about the limits of love through a simple question – how can a person prepare for a break-up? Catch the untold story of the Cebu’s Hugot King’s (Roy Ucat) love life this March 7 as it hits the big screen. If small towns with secrets gives you chills, then get ready to unravel the mystery of Devil’s Gate this March 7. Follow the investigation of an FBI agent who arrives at the isolated town of Devil’s Gate, North Dakota to examine the disappearance of a local woman and her young son. As they track down the missing woman’s husband, they discover that this small town hides more terrifying abominations than they bargained for. If stalkers and mental institutions give you the creeps, then Unsane will surely test your nerves. A young woman visits a psychiatrist as she believes her stalker has returned – but the real terror begins when she is suddenly and involuntarily committed to a mental institution. Drugged and isolated, she starts to question whether her fears are real or all a delusion. Catch Unsane as it open on March 21. Plan the best date with your squad this March and catch these exclusive movies at your nearest SM Cinema branches. Shrieks and screams allowed! Book your tickets now through the website, www.smcinema.com or download the SM Cinema app now through the App Store and Google Play and skip the line. Stay tuned to SM Cinema on Facebook and @SM_Cinema on Instagram for more details.